Sterilise 3 x 1 litre bottles. Carefully rinse the elderflowers to remove any dirt or insects. Pour 3 litres boiling water over the sugar in a very large mixing bowl or clean bucket, stir well and leave to cool. 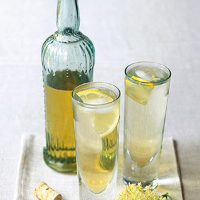 Add the lemons, tartaric or citric acid (this will help to preserve the cordial, but it isn't necessary if you intend to use it straight away) then the elderflowers; cover with a lid or tea towel. Leave in a cool place for 24 hours, stirring occasionally. Strain through a muslin-lined sieve and decant into the bottles. The cordial will keep for 2–3 days in the fridge or for up to 1 month if using acid. Dilute to taste and serve over ice with a slice of lemon.